By the time of his Springbok debut in 2010 Louw had already racked up 50 appearances for Western Province as well as forming part of the Stormers' highly-successful loose trio alongside Schalk Burger and Duane Vermeulen. Having started their Super 14 final defeat to the Bulls in Soweto, Louw was rewarded with a call-up to the South Africa squad for their June Tests. He debuted against Wales in Cardiff before scoring his first Test try in a rout against France at his home ground, Newlands. He is the grandson of former Springbok lock Jan Pickard. 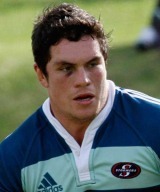 In July 2011 Bath announced the capture of the flanker on a three-year deal. The move sees Louw replace former skipper Luke Watson in the West Country side's backrow.